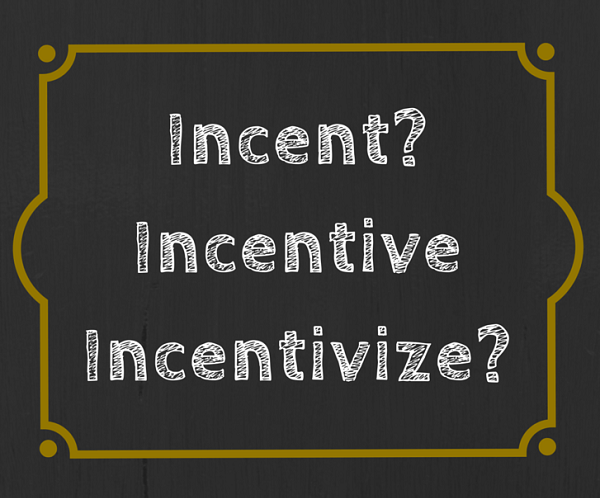 Grammar Hammer: Incent, Incentive, Incentivize? A classic sales tactic is to create a promotion that gives potential customers an incentive to buy. Almost every advertisement for a new car includes incentives for trading in your old one, or having the dealership do your taxes and double your refund to use as your down payment. One highly-publicized example of “incentive marketing” was Chipotle Mexican Grill’s promotion to give away a free burrito with every tofu entree purchased. Even though many of Chipotle’s customers are meat-lovers, they were given an incentive to try a vegetarian option. I also didn’t think “to incent” was a proper verb. To me, it sounded too similar to “incite” and I don’t think managers want to provoke their employees. However, “incent” and “incentivize” are now recognized in the Merriam-Webster dictionary, so even though these sound like non-words to me, they’re here to stay. There is one important distinction between “incent/incentivize” and “encourage/motivate,” and it’s the nuance that needs to be seen. Incentives are a reward and are used when the target audience isn’t propelled into action without the incentive. Encouraging and motivating someone is part of good leadership and doesn’t require a carrot at the end of a stick. I can accept the fact that “incentivize” is a word and will likely see its use increase, but I can also decide that in my own writing, I will find another word. If I’m trying to motivate or encourage my team by offering them a perk or reward, it’s an incentive. I do not intend to incite or incent them. Want more grammar and writing tips? Subscribe to Beyond Bylines to receive our blog posts by email. Thanks for this. I detest the word incentivize and like you, will never use it. To me it seems like dumbing down our language.